McKee's 37 Leather Shampoo 70/30, 8 oz. McKee's 37 Leather Shampoo 70/30 128 oz. Free 32 oz. Spray Bottle! Makes your interior smell like a leather factory! 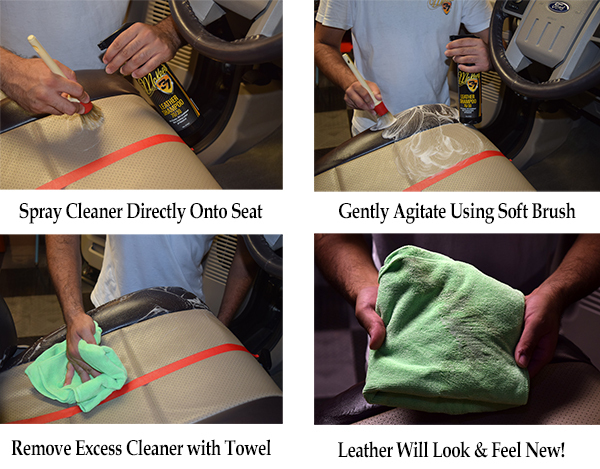 McKee's 37 Leather Shampoo 70/30 can remove just about any stain from your vehicle's leather upholstery. This non-alkaline cleaner forgoes petroleum solvents, silicone oils, and gloss agents. Instead, it relies on advanced chemistry to penetrate deep into the leather, lifting dirt and grime from every pore. As the cleaner goes to work, lanolin and mink oil are fed into the leather, ensuring it remains soft and supple for years to come. It's a fantastic product. Not all cleaners are created equal! High-octane, all-purpose cleaners break down the natural oils found in the leather. These oils are added during the tanning process, giving the leather its rich, luxurious feel. McKee's 37 Leather Shampoo 70/30 preserves these oils, extending the life of the leather. McKee's 37 Leather Shampoo 70/30 is safe to use on light and dark colored leather surfaces. The rich, foaming lather is designed to protect the leather from being scratched during the cleaning process. What's more, Leather Shampoo 70/30 is 100% safe for delicate stitching. As a matter of fact, it's beneficial for the stitching to be gently cleaned using Leather Shampoo 70/30! Vacuum to remove loose dirt and grit particles. Test colorfastness on an inconspicuous area. Spray cleaner directly onto surface and allow to dwell for 30 seconds. Gently agitate the cleaner using a soft-bristled brush. Wipe away excess cleaner with a dry, clean microfiber towel. Note: Do not use a brush when cleaning King Ranch style leather.